This popped up last week and we never got around to posting about it, but I didn't want to ignore it completely. For those not familiar, John U. Bacon is a renowned writer, author, lecturer, historian, and a general guru for almost all things related to Michigan athletics. He's probably most well known for his book "Bo's Lasting Lessons", but can be read pretty anywhere from the NY Times to ESPN Magazine to The Detroit News. 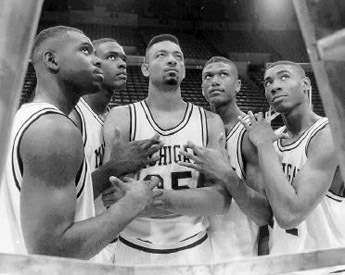 Last week, after the ESPN documentary on the Feb Five aired, he posted his take on the Fab Five in a post titled "Fab Five: Then and Now"...to his blog, which should be considered required reading by any and all Michigan fans. A few others, like Greg from MVictors, have offered up their take on his post, so I won't dive in too much. But it's a very good read, and worth a few clicks if you have the time. When Fisher was fired, he said they’d built an elite program, which was true, and they’d “done it the right way,” which wasn’t – and by the time he was fired, he had to know it. To this day, Fisher has never accepted any responsibility for what happened on his watch, and Chris Webber has never apologized for taking over a quarter-million dollars from a booster. Fisher now coaches San Diego State, which played in the Sweet Sixteen last night, while Webber is a very wealthy TV commentator. Those who followed them at Michigan paid the price for their mistakes. Twenty years ago, I thought the leaders of the Fab Five were Steve Fisher and Chris Webber. But it turns out the real leader was Jalen Rose, who finished his degree by writing term papers in the back of NBA team planes. He and the other three have proven to be thoughtful, successful and even honest men, committed to their communities and their families. I’ve come to have great respect for them – and much less for their so-called leaders. Below is the accompanying audio that Bacs posted along with his article.